July 5, 1925 - October 1, 2013. 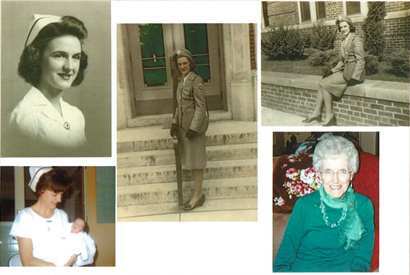 On August 16, 1943, I entered the St. Francis School of Nursing in La Crosse, WI. At the time it was depression years. My parents were struggling financially but willing to find some way to pay. Can you imagine how $300 for 3 years was a financial burden? I wanted to be a nurse since I was a little girl. A few days after admission, we were called into assembly and told that the school had been accepted by the United States Cadet Nurse Corps. It was an answer to our prayers, and I was also able to serve my country in the time of WWII. For the next 30 months, I went to classes, did floor duty on the general units and specialized departments. We worked all three shifts including split shifts. I was in the Communicable Disease Department during the polio season. We had six patients in the iron lung of which one survived. During our last six months, I worked on several different units, including OB. In OB it was nine months after the war was over and we had babies, babies, etc. OB was my favorite department. We also studied for State Boards and I am happy to say I passed on my first attempt. For the next 34 years I worked in many areas including Medical, Surgical, Orthopedics, OB, and Office Nursing. After graduation I worked one year in Highland Park, Michigan, in OB, and in 1955-1956 I worked weekend float Nurse in Denver General in Colorado. In 1950 I married Walter Swinghamer. He served in the Aleutians WWII -- Staff Sargeant in the U.S. Air Force. He worked for Whitaker General Medical until retirement. Our daughter, Sandy, was born in 1954, our son Jim was born in 1956. Our daughter has worked as a CCU Nurse and is now a Telephone Nurse Advisor. Our son is a Nuclear Medicine Technologist in a VA hospital. His wif is the District Manager for Cardinal Health Nuclear Pharmacy Services. They have two daughters. Erin will start as a fourth year Pharmacy Student at Drake University. Kelly will be a first year Psychology student at the University of Wisconsin - La Crosse. She is interested in occupational therapy. Our son-in-law owned Fanning Electric and is retired. In 1957, I went to work in OB-Labor and Delivery and in 1967 I was appointed Head Nurse. In 1980 I retired from St. Francis Medical Center on disability with MS.
A collage of Rita Swinghamer as Nurse (left), Cadet Nurse in uniform (center and top right), and now.